Vegetation removal and replacement, new signage and a walking tour brochure are among the improvements made recently at the Paul E. Hayden Educational Wetland at Tusculum College. The projects, funded by a 319 grant administered by the Middle Nolichucky Watershed Alliance, were carried out with assistance from Kristen Lane, a graduate of Tusculum College and an Appalachia CARES AmeriCorps Member serving with MNWA, and Dan Barnett, former faculty member at Tusculum and the current chairman of the MNWA. Other key assistances was provided by Tim Ormond, hydrological engineer from Asheville, N.C. 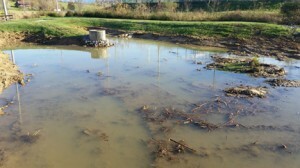 The Paul E. Hayden Educational Wetland provides science students with an outdoor classroom and experiment center, while tending to the environment that supports campus life. In addition, the wetland provides stormwater retention from parking lots and roadways. This allows the pollutants to settle out of the water before it returns to College Creek and ultimately the Nolichucky River. According to Lane, cattail removal was completed at the site in early spring, with more than 150 volunteers working at the wetlands in this effort to remove cattails and clean up the wetlands, as well as transplanting some other vegetation. Lane explained that the cattails had become invasive and were actually preventing the wetland from cleaning the moving stream as it was designed to do. Additionally, signage has been added to describe the habitat for those who visit the wetland on their own. Barnett said that three separate signs were placed on the walkway. Each of the signs focuses on what the wetland is, how it works and what can be seen from the walkway. He added that a brochure with additional information about the Hayden Wetland is also in production that will be available at the site as well as online. “By the end of April everything will be complete and in place and school students will be begin visiting in May,” said Barnett. More than 600 Greeneville and Greene County students have participated in educational programs at the wetland since its completion in 2013. The 319 grant received by MNWA for the project came from the Environmental Protection Agency and the Tennessee Department of Agriculture. More than $15,000 has been spent on upgrades at the site to date. “The wetland project is an invaluable resource to the environment and serves to support educational experiences for the science program. 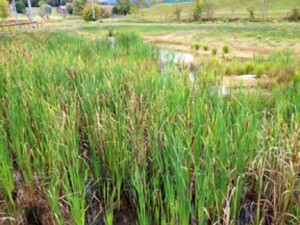 In addition to Tusculum students, this wetland is a community resource in which the college collaborates with the Greeneville City and Greene County school systems to provide an environment for research ranging from elementary education to college senior projects,” said Dr. Nancy Moody, president of the college. In February, the Tusculum College Board of Trustees was informed that a gift had been received by the college that would allow for a pavilion to be constructed as part of the Paul E. Hayden Educational Wetland project, and plans are in the works. MNWA made an additional contribution to this project for some construction materials and architectural design. The Hayden Wetland project has been collaboration with the MNWA since the beginning when Hayden headed the organization. The college continues to support MNWA by providing the organization office space on campus. Additionally, the living stipend for the AmeriCorps member position has been generously provided by Dr. Scott Niswonger, local businessman, philanthropist and member of the Tusculum College Board of Trustees. The wetland was named in honor of the late Paul E. Hayden because of his commitment and dedication to seeing the project through to completion and his many years of environmental stewardship.